Piper Books are carefully structured to ensure that all children can learn to read from the very first book. The early stories are gentle, appealing and humorous and children readily identify with the little weaknesses and vanities of the endearing characters. The BRI Starter Pack contains everything you need to get started. It takes only a few minutes to read the Guide and the brief instructional information in the books. BRI 1 and BRI 2 consist of 48 books that your child reads to you. 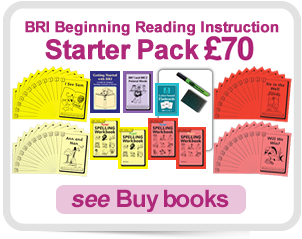 Each new piece of the reading jigsaw is carefully introduced, with plenty of repetition to help the child move from decoding to automatic and fluent reading. Stories are brimful of life as endearing animal characters engage in mischievous little tricks, resolve their differences and explore their world. Armed with BRI’s simple instructions, the exciting journey towards fluent reading begins. The hardest adjustment for the home schooling parent will be to resist the temptation to overhelp. Only the child can do the work; helping too much will make the journey longer. An outline of each story is included and can form the basis of lively discussion as well as helping to engage a child in the adventures and character interaction that unfold in each tale. Story questions are included at the end of each book to ensure that there is full comprehension. A reading of each book can normally be carried out during one short session. A few children will take longer – but this is not a problem. Instilling good reading habits is far more important in the long run than rushing through the books. The three Sets of BRI books are usually completed by children in little over a year. After this, some children can move to simple chapter books while others need to complete only one or two sets of ARI before they are competent readers. A minority of children will benefit from reading right through to the end of ARI 5. 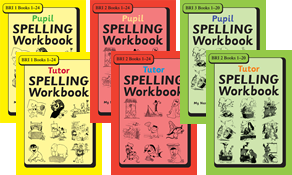 ‘Light touch’ SPELLING Workbooks augment the reading programme.